With an ambitious plan to become carbon neutral by 2030, Aarhus is focusing on broad public engagement and future energy infrastructure. Since 2008, when the Aarhus Municipality committed to carbon neutrality by 2030, the municipality has managed to halve its CO2 emissions as part of their green transition. This was done by reorganizing its heat and energy generation as well as energy renewal of existing buildings. The Climate Plan 2016-2020 contains 50 climate initiatives, putting Aarhus on the path to carbon neutrality. One of the milestones in the climate plan is to create a strategic planning framework for the future energy infrastructure. Another initiative is a tool which helps to ensure that city planners include energy and infrastructure aspects in urban planning in a timely manner. This kind of strategic energy planning can lead to innovative energy solutions that benefit both the municipality and businesses. The climate plan not only takes into account the typical areas of climate mitigation such as transport, buildings and industry, but also focuses on areas where the municipality does not have direct influence: its citizens. Aarhus Municipality has therefore created the Climate Game (Klimaspillet), where citizens can choose actions that reduce CO2 emissions and see the effect of their choices. The game has proven effective in increasing understanding of climate action, and is now being used in 100 primary schools and high schools in Aarhus Municipality. Aarhus Municipality wants to be an attractive city to live in. An often forgotten precondition is an energy system with affordable and secure supply, which the climate plan will help to provide. 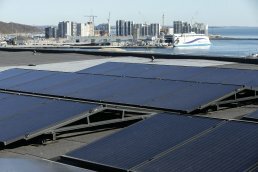 Since 2008, Aarhus Municipality has halved its CO2 emissions by reducing energy consumption in municipal buildings by 25%. The Climate Plan 2016-2020 was created through cooperation between 250 different actors. Five seminars were held and roadmaps developed with over 60 solutions to the biggest climate challenges.